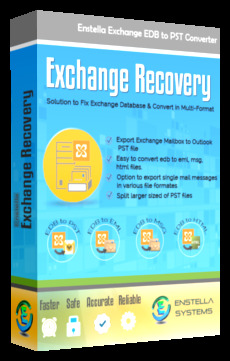 If you are not able to read your exchange EDB database and want to get back your data in a readable format so you can try Enstella Exchange EDB to MSG recovery software which can successfully recover corrupted exchange database and restore exchange EDB to MSG. By using Enstella Exchange Database to MSG converter you can quickly extract EDB emails to MSG formatting with all EDB emails metadata- emails, appointments, journals, contacts, task etc. FILERECOVERY 2016 Professional runs under the Windows 2000/XP/VISTA/Win7/8,10 Server 2003/2008/2016 supporting FAT 12/16/32 and NTFS file systems with scanning and recovery from HFS formatted volumes.